Swimming pools have quite a long history, and it has been a history of innovation. From the baths of ancient Greece and Rome, to the backyard pools of today, let’s take a look at how the swimming pool has changed and evolved over the years. Pools really started to take off in popularity in the days of the ancient Greeks and Romans. Individual wealth was increasing by leaps and bounds and personal pools were seen as a luxury item, or a status symbol. They were also appreciated for their aesthetic value, much like your Ellicott City custom pool is today. Water played such a large part of society back then, and pools were placed everywhere for many different reasons. Not only were they used for their aesthetic value, but the pools were also used for bathing, health, religious ceremony, socializing and much more. Pools back then were also used to train soldiers for war. Greek and Roman militaries would use swimming exercises to increase their strength. The great Greek philosopher Plato felt that every child needed to learn to swim as part of a proper education along with mathematics, writing, astronomy, etc. And, in fact, it was standard education to teach children to swim in pools dating all the way back to 400 BC. In AD 305 the Romans built an incredible pool that was over 900,000 square feet. This pool was used for bathing and was also heated by giant fires in the basement beneath the floors of the pool; the columns and walls pumped the heat up to the pool above. Today, we have something a lot more advanced for your Ellicott City pool, but it’s pretty cool that they even had heated pools way back then! Competitive swimming was first introduced in the 1700’s in Britain by the National British Swimming Society. Back then, the National Swimming Society of England used man-made indoor pools in London for swimming competitions. These events became popular in England and led to the formation of the Amateur Swimming Association in 1880. Swimming pools firs came to the U.S. in the early 1900s. There was a swimming hole in Texas where people would just go and swim. In 1915, the land surrounding the swimming hole was purchased and a resort was built. Deep Eddy Pool is listed as a historic landmark on the National Register of Historic Places and has been the inspiration of various works of art. The first recorded above ground swimming pool in the United States (and one of the first in the world) dates back to 1907, and is credited to the Philadelphia Racquet Club. After World War II in America, swimming pools really took off. They were seen as a status symbol. Today, swimming pool technology is still constantly evolving. Swimming pools can be found everywhere. If you’re looking for the latest technology for your Ellicott City pool, call Rhine Pools today! 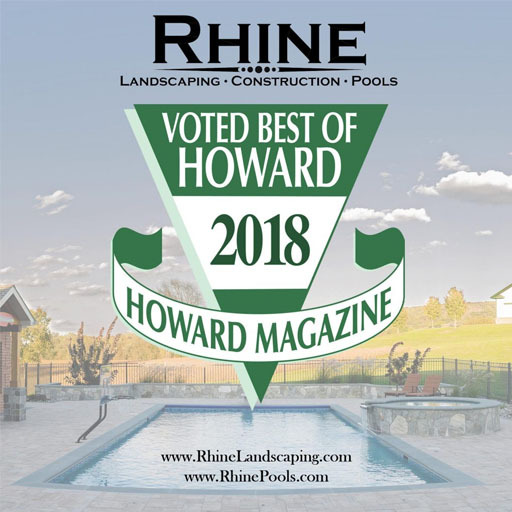 CALL RHINE POOLS FOR YOUR ELLICOTT CITY POOL TODAY! If you have questions about pool ownership, Rhine Pools is here to help. We are an all-inclusive company, so you won’t need to worry about working with ten different project managers and faces over the course of your project. Spring is a great time to step up your outside aesthetic, our services include patios, decks, shade structures, fireplaces, outdoor kitchens, water features, plantings, lighting, and even more! Whatever you want as part of your pool and landscaping, Rhine Pools can handle the job! For more information and details on proper pool maintenance, give us a call at (410) 442-2445 or visit us online. For more pool design tips, follow us on social media at Houzz, Facebook, Twitter, Pinterest, YouTube, and Google+.